The ATM Ladies offer several ATM options that allow you to get an ATM machine in your business quickly. Before we get into the ATM options available for your business, if you do not know why you should have an ATM in your business yet, then please check out Why An ATM first! If you are looking for mobile ATMs for an upcoming special event that you are having them please go right to our Mobile ATMs section of our website. This program is a 100% hands off program for you. Which means it’s Done For You and we handle everything that has to do with the ATM; including installing it, loading it with cash, servicing it, insuring it, etc. The only thing that you need to do with our Done For You Program is to make sure you have a 110v power outlet available for us to plug your new ATM in to. With our Done For You Program we even share our profits with you! To get more detailed information about this program please go to our Done For You Program page. This program gives you more responsibility for the ATM in your business, but it also means you share in more of the profits…..50% to be exact! 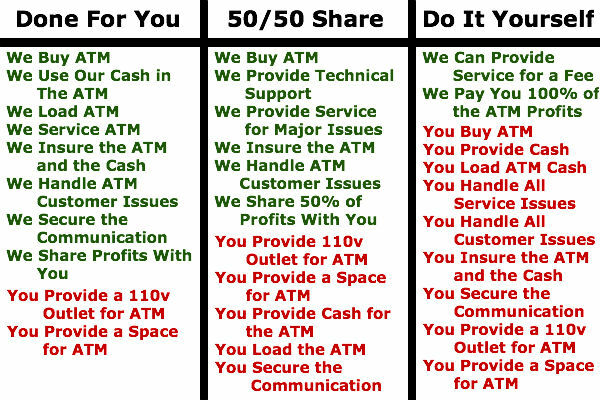 Your responsibilities with our 50/50 Share Program are to make sure you have a 110v power outlet available for the ATM, a phone line available for the ATM, you’ll handle minor service issues and lastly, you are responsible for the cash that goes inside of the ATM; plus the re-loading of that cash. To get more detailed information about this program please go to our 50/50 Share Program page. With this program you are 100% responsible for everything that is required to keep your ATM functional in your business. The good thing about all of that responsibility is that you now make 100% of the profits. To get more detailed information about this program please go to our Do It Yourself Program page. Which of These ATM Options is Right for Your Business? If one of our above ATM options appears to be what you are looking for to help your business succeed even more than please feel free to call us today at 610-466-5710 or you can reach out to us on our Contact Us page. If you are looking for something different than the ATM options listed above then please call us at 610-466-5710 and we will try to come up with a suitable solution for your business.